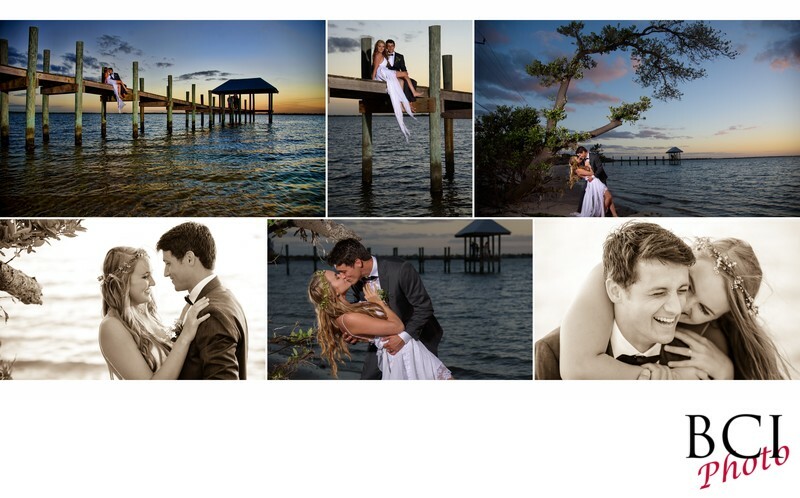 An actual wedding album page design showing several wedding portraits taken at the house of refuge in stuart. This example of a wedding album page design shows about the maximum number of images you'd want to include for this sort of page. Less is more. This is almost too much, but we had to fit the images into just 40 pages. This is why we highly recommend more pages to work with so the design wont feel cramped. Several of the romantic wedding portraits on this page could easily have been a two page spread panorama. But again, when you have a ton of outstanding images and only 40 pages to work with, making a nice collage is the next best option.